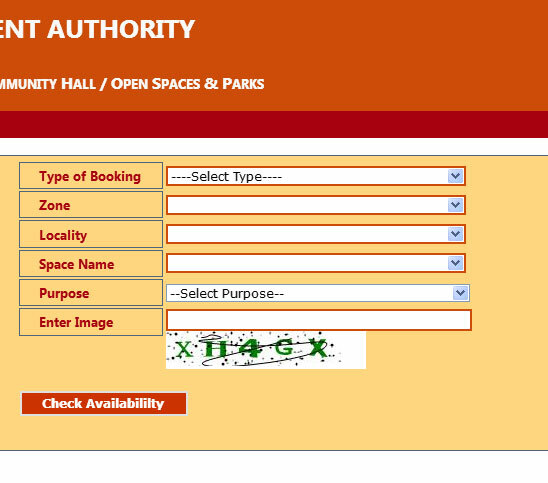 Citizens who wish to make a booking for community hall/open spaces for marriages and other family functions can do so online at the DDA website. Community hall can be booked 120 days in advance for marriage purposes. For other purpose booking can be made only 30 days in advance. Community halls are categorized into two A & B categories and the charges for the hall depend on the category of the hall. For booking DDA community hall online, the charges had to be borne by the applicant which includes booking charges, cleaning charges, security deposit and GST. Some documents are required for booking of marriage halls or generally community halls like proof of residence, date of birth, photograph, Pan/Aadhaar card etc. To book online dda community hall, you need to check the availability of the particular community hall or open space on the stipulated date. Select Zone from North, South, East, Dwarka and Rohini. Choose Purpose from Marriage, Religious and Others. Enter Captcha image and click Check Availability. 4-5 months data would be displayed which shows Blocked, Booked and Available for Booking dates. That's it. 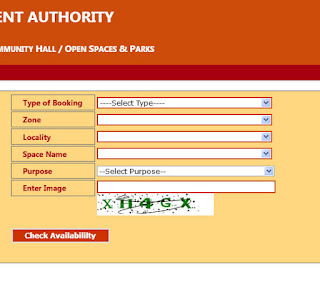 In this way one can check availability of community hall or open space booking.